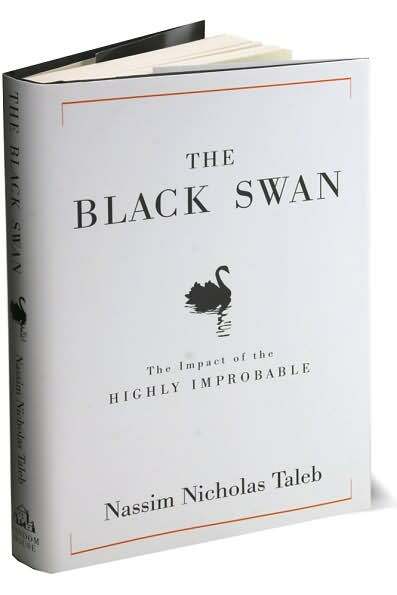 Extreme events are more likely than we think - Taleb calls these "Black Swans" after the one-time European certainty, based on northern hemisphere experience, that all swans were white. Before we had an inkling of the global financial crises starting in 2007, Taleb, with almost impeccable timing, discusses the risks inherent in the big banks, and goes on to say, “Likewise the government sponsored institution Fanny Mae, when I look at their risks, seems to be sitting on a barrel of dynamite,..”. I should say, he wrote the book in 2006 and published in 2007. I, like many others, would ask, why isn’t this required reading for those thinking of wanting a life in politics, economics and/or finance. The Black Swan challenges our desire and ability to acknowledge the impact of unknown, highly improbable events that can and will occur over our life-times looking at some of the features of human psychology that make us poor at evaluating uncertainties and risks, instead, amongst other things relying on narrative explanations and blinkered views. In “The Black Swan,” Taleb proclaims that the unexpected is the key to understanding not just financial markets but history itself. History, he writes, proceeds by “jumps,” controlled by “the tyranny of the singular, the accidental, the unseen and the unpredicted. Whilst the book contains numerous insights evidenced by examples such as: “We attribute our successes to our skills, and our failures to external events outside our control.” Like all things, there are shortcomings. The bulk of this book is underpinned by criticizing others for failing to see the future — though who exactly can see the future? And on this Taleb generalizes, for instance scoffing that the collapse of the Soviet Union was an unfathomably unlikely event that “no social scientist saw coming.” The historian John Mueller’s brilliant 1989 book, “Retreat From Doomsday,” published just before the Berlin Wall fell, did see it coming. The Black Swan is brilliant, thought-provoking and challenging in the most constructive and valuable ways.